Description: Dimensionally comparable to the USS plain washer, but with a smaller outside diameter, manufactured from a higher grade of steel and heat-treated. Applications/ Advantages: Designed to be used with A325 & A490 structural bolts. 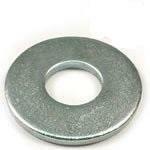 Have questions or need more information about our 'F436 Type 1 Structural Flat Washers Zinc Plated', please contact us?